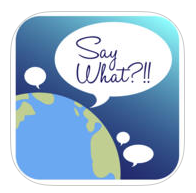 (PRLEAP.COM) June 22, 2016 - Fastforward Productions is excited to announce the launch of a revolutionary translation app called Say What?! !, now available in the iOS App Store and Google Play. Thousands of dictionaries and translation apps target travelers going to non-English speaking countries, but this unique app focuses on the language barriers travelers may face, even in another English-speaking country. Say What?!! has you covered, whether you are traveling to England, Scotland, Australia, New Zealand, Jamaica, or South Africa. Select the appropriate country and review the list of words and phrases. Whether you are on the plane, ordering a meal, or walking through the streets of your destination city, you can check the list for updates, search for new words, or even translate a phrase back to American English. "No one wants to be misunderstood in a potentially embarrassing way on a business trip or vacation," commented a spokesperson for Say What?!! "Our app makes avoiding these problems simple and fun. Say What?!! is the perfect tool when it comes to understanding the different meanings of an English word in different countries." While currently supported in six Anglophone countries, Say What?!! is continuing to add other popular English-speaking tourist and business destinations to its content library, as well as adding other languages. Heard a new word or phrase on your travels? Add your find to the country's list! Care for "chips" or "fries"? A "jumper" or a "sweater"? With Say What?!! on hand, a traveler can explore and enjoy exciting destinations with their confident use of the local slang. Say What?!! is available in the iOS App Store and Google Play today. For more information, visit their website saywhattravelapp.com or follow them on Facebook and Twitter. Fastforward Productions is a tech company based out of Annapolis, Maryland, and is excited to be entering the app development arena. The company's flagship product is the Say What?!! language app, designed to help travelers in English-speaking countries understand unique national and regional meanings for common English words.